From Dublin to the Kremlin - In Your Pocket makes Irish dreams come true. › From Dublin to the Kremlin - In Your Pocket makes Irish dreams come true. 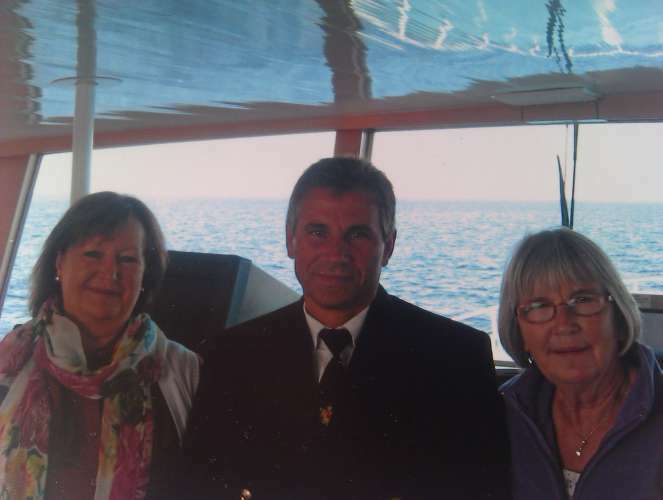 Pauline and Mary with the ships captain. With fellow passengers in the Nova Lounge. 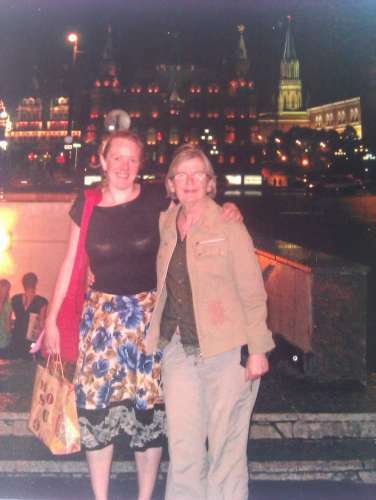 Mary and Bonnie from Russia In Your Pocket outside the Kremlin. 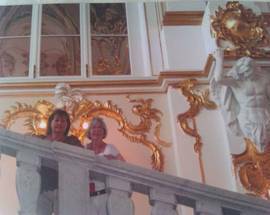 Pauline and Mary in the Winter Palace, St. Petersburg. Mary admires some local threads. Each year RTE, Ireland's national broadcaster, pays tribute to someone special as part of The Afternoon Show's 'Random Acts of Kindness' strand. And this year, the programme turned to Dublin and Moscow In Your Pocket to come up with a suitably spectacular prize for the worthy winner. 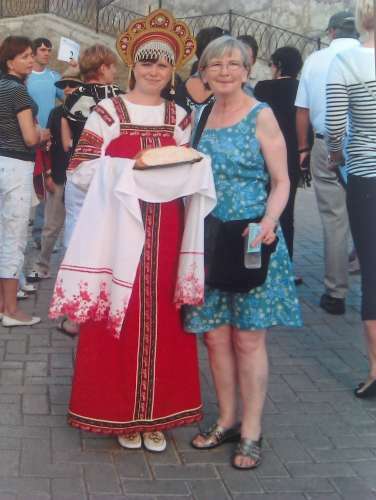 Mary Magan, together with her sister Pauline, travelled from her hometown of Limerick to Russia to enjoy a luxury seven-day cruise from Moscow to St. Petersburg courtesy of Volga Dream, Lufthansa and In Your Pocket. Nominated by her neighbour Leila for all her efforts in the local community, Mary's reaction to her win was characteristally modest. “I was very overcome when I was nominated because I normally do things very quietly and don’t expect any praise for it", she said. "What was going through my head was that there are thousands of people doing things like me, and more”. Come rain or shine Mary is at her post as a lollipop lady at St. Paul's National School, Dooradoyle, Co. Limerick, where she has guided two generations safely across the road. In her spare time she cares for an autistic boy, giving his mother some respite. And this selfless lady has also fostered many children over the years, works with the elderly, and has helped immigrants in the community get jobs and furnish their houses. 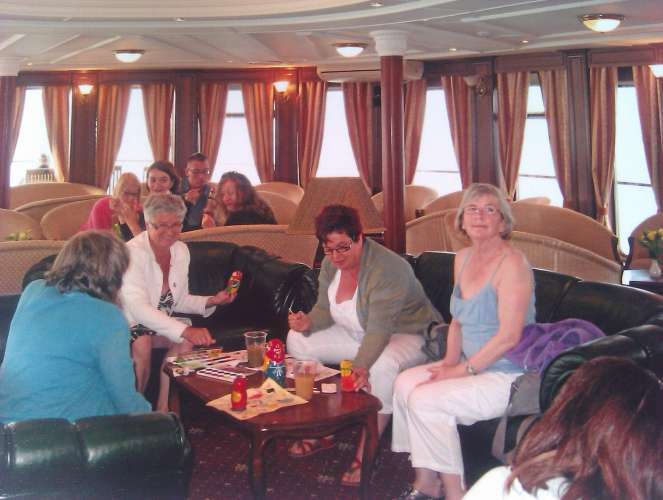 Mary and Pauline took the cruise in August during the school holidays. "I always said I would go on a cruise at some stage" Mary told us. "I thought I might go when I retired, but not this soon!”. 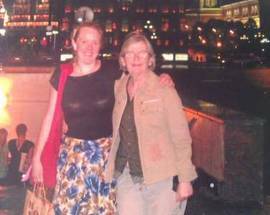 On arrival in Moscow, the sisters were met by Russia In Your Pocket's Bonnie van der Velde who took them to Red Square and other sites close to their Marriot Royal Aurora Hotel. The following day Mary and Pauline entered the Kremlin for a visit to the Armory Museum with its collection of Tsarist thrones, ceremonial crowns, coaches and gifts of state. They also visited the 15th Assumption and Archangel Cathedrals which Mary described as "truly beautiful". That evening they boarded the MS Volga Dream for their cruise along part of Europe's longest river. 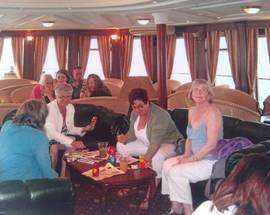 "There were one hundred guests on board and a staff of 55, so you can imagine how well we were looked after," said Mary. A Captain's welcome reception and dinner marked the start of their voyage which was enjoyed by guests of many nationalities, including Belgians, Americans, Dutch and Spanish. "We enjoyed beautiful weather every day," Mary told us. "There was woodland on both sides of the Volga, and we visited some historic villages, churches and UNESCO World Heritage Sites. My favourites were Kizhi Island - the architecture was fantastic and everything was made of wood - and the village of Mandrogi with its beautiful wooden houses and craft workshops." 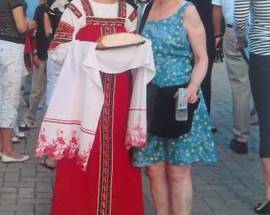 Back on the ship, Mary and Pauline had a go at making Russian pancakes and speaking a little local lingo which Mary described as "too much like hard work!". Both ladies said the food on-board was "beautiful and plentiful", and, on one occasion, had "a wonderful BBQ lunch on deck. It was about 25 degrees that afternoon and everyone was on great form!". When the ship docked at St. Petersburg, the passengers enjoyed a three-hour city tour. 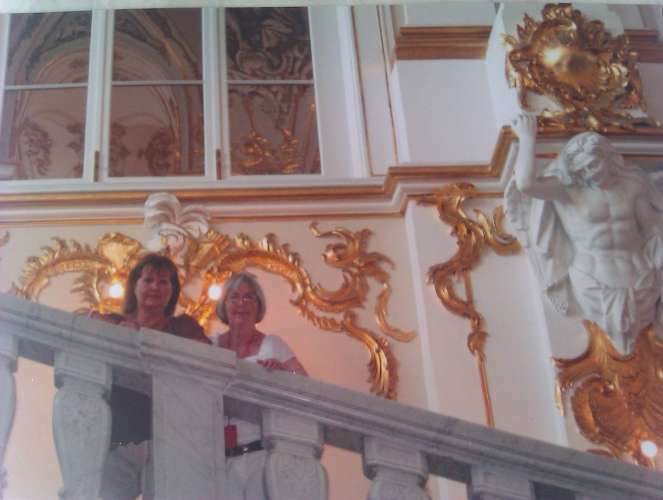 "The highlight for me was the Winter Palace, home of the Russian Emperors from 1763-1917." said Mary. " "The collection of works was overwhelming and will stay in my memory forever." A final overnight at the Angleterre Hotel concluded an unforgettable, and well deserved, holiday for Mary and her sister. Dublin In Your Pocket and Moscow In Your Pocket were delighted to provide this fantastic holiday for Mary and Pauline and would especially like to thank Volga Dream and Lufthansa Airways for helping to put together this trip of a lifetime. Premier Inn Dublin Airport also provided free overnight accommodation prior to their flight, and car parking during their trip. If you fancy following in the ladies' footsteps, visit www.volgadream.com and russia.inyourpocket.com.